Chris Lee, Houston Firefighter, does a memorial skydive for fallen firefighters in June 2013. Rosharon, Texas (June 12, 2014)— On July 5, skydivers/Houston firefighters Chris Lee (HazMat/22-D shift) and Clint Meade (firefighter/paramedic in training) will organize a memorial skydiving event at Skydive Spaceland for the Houston firefighters who were killed or injured battling the deadly hotel fire in Houston on May 31, 2013. The fire killed four Houston Fire Department (HFD) firefighters and injured 13 more, making it the deadliest incident in HFD history. Last year, Lee hosted the first annual event for firefighters, family, and friends to share remembrances of their loved ones. 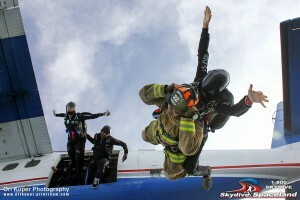 Several of those made their first skydives that day as well with a generous $50 discount for HFD employees. Sabina Bebee, whose son Robert was one of the fallen firefighters and had jumped at Spaceland, was one of them. This year, Bebee along with several other friends, family members, and firefighters plan to skydive again or for the first time. Skydive Spaceland is offering a $50 discount off first-time skydives for HFD employees; Lee is rallying the jumpers to arrive by 12 pm to jump together. Clint Meade, a student skydiver and former Marine who recently moved to the area to work with the Houston Fire Department, will jump in his bunker gear around 5 pm as Lee did last year. He’ll jump with several other experienced skydivers in formation to honor the departed/injured firefighters and their families. “This year is about raising awareness of the shared brotherhood firefighters and skydivers have, watching each others’ backs and keeping each other safe,” said Lee. Lee and Meade are also planning for skydivers to fly an American flag, graciously donated by Bill and Trey Rousey of Top Brass, for the crowd. In addition, the Garner Foundation will be on hand selling T-shirts and Dynamo-autographed items to fund scholarships for future firefighters attending fire academy. Spectators are encouraged to attend, watch a day of skydiving at one of the largest skydiving centers in the world, and support the Houston Fire Department.